Dulk (Antonio Segura Donat) is a hungry and insatiable all terrain illustrator. Urban art, illustration and graphic design are his fields, his twisted imagination does the rest. He has shown his work all over the world in walls as same as exhibitions. His style is an explosive combination of influences like the surrealism or the obsessive detail brushwork of Flemish painting, all mixed with a bizarre, burlesque and affectionate touch that makes it compact, direct and very honest. 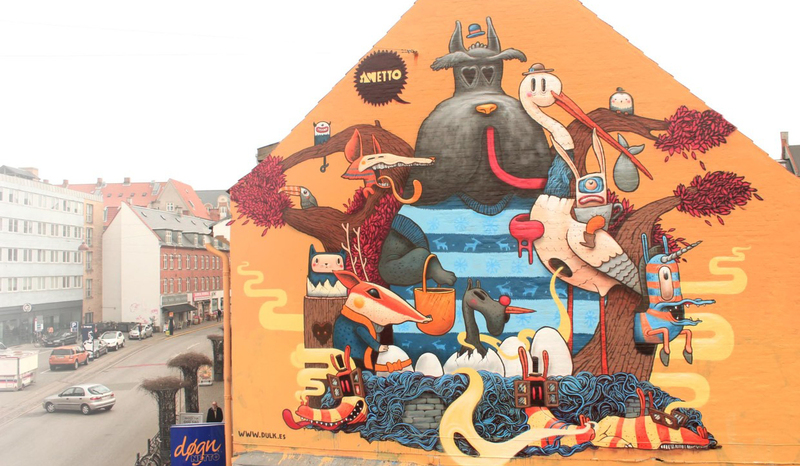 – Dulk is a really strong name in our line up for 2015, one of his pieces from 2014 ended up on the international art magazine Juxtapoz list of the 20 best street art paintings in the world for that year. Dulk really masters almost any kind of art, from traditional drawing to street art murals and sculpturing. I´m sure his piece in Borås will be loved and enjoyed by many, says curator Shai Dahan. – I think every visitor to No Limit will love Dulks work, perhaps especially the younger ones as the motifs of Dulk often contains figures from the world of fairytales. 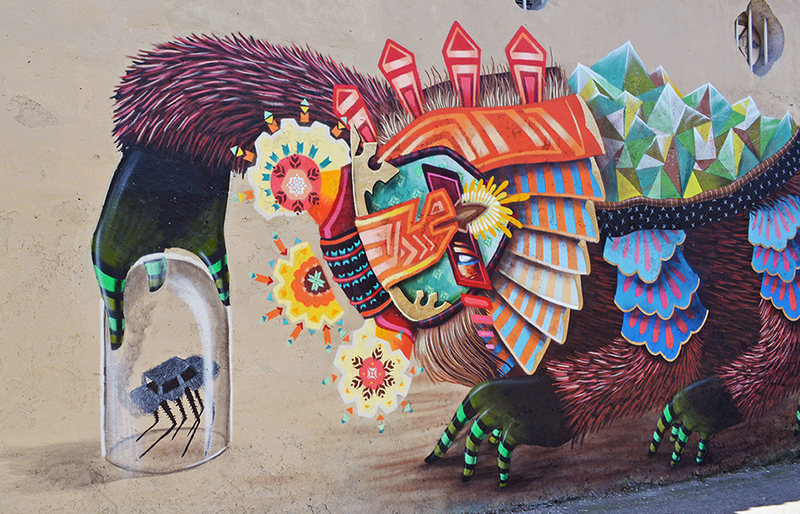 The murals I´ve seen from Dulk is totally awesome, detailed and beautiful. It will be a true pleasure to see what he creates in Borås, says project manager Stina Hallhagen. Antonio enjoys creating compositions with lot of characters and stories based on his own dreams and everyday events, mixing fact and fiction. Nowadays Antonio is living in Valencia, his hometown, where he works day by day as freelance illustrator. 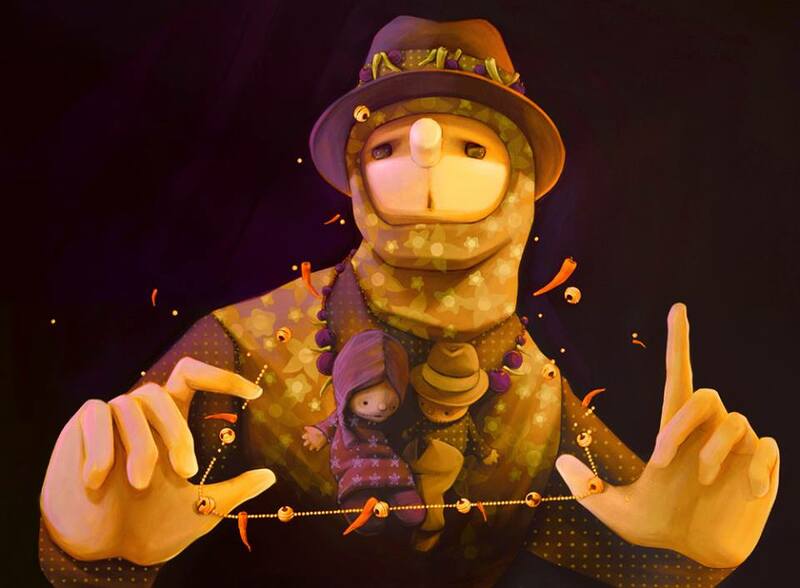 His artwork is focused in children illustration, art development for animation, advertisment or street art. He works his own style in each media. “The most important is the style, feel yourself and enjoy with it”. Muralist devoted to street art, specifically to graffiti, since age 15. In parallel he studied at the Fine Arts School of Viña del Mar. Despite criticism from detractors of artistic expression in public spaces, his works won a space on the streets and buildings of Valparaiso, first, and then in cities all over the world. Based in Paris right now, he has established himself as a benchmark of street art, muralism and international graffiti, being constantly invited to festivals and exhibits related to avant-garde art in South America, Europe and the United States. Inti was born in Valparaiso, Chile 1982. Inti´s work is mainly inspired by pre-Columbian and Andean cultures, rescuing and redefining iconography and symbols that are both ancient and contemporary. Currently, we can find his mega murals in countries as diverse as Lebanon, Norway, Bolivia, Poland, Puerto Rico, France, Canada and others. The list keeps on growing with his frequent travels. – Inti was one of my first choices back in 2013 when we started to look for artists for No Limit 2014. Unfortunately he couldn´t make it to Sweden by then so I´m really happy that he accepted our invitation this time. Inti´s work is really iconic and his large murals are both mystic and beautiful, says curator Shai Dahan. – I´m really looking forward to see Inti´s work in Borås. His colossal murals got a special kind of mystic energy and bright colours reminding of the latin culture. The only thing I could wish for is higher buildings in Borås, says project manager Stina Hallhagen. 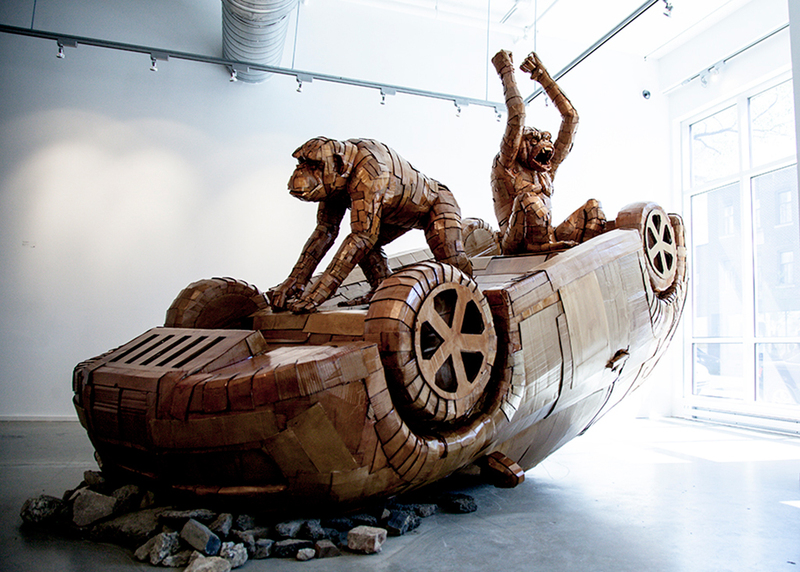 Born in Québec city in 1986 this young artist was discovered by the creation of large-scale sculptures in cardboard. She studied at Concordia University in visual arts before doing an exchange program in Los Angeles to further her knowledge in ceramics. It’s only after graduation and doing an artist residency in Russia that she appropriated the street art influence in her work. By using cardboard, material that she finds in abundance in the street she can create large work on the spot in every part of the world she goes. It’s in 2012 that her carrier started after she organized a show called Transmute for the Montreal’s winter Festival. This first step in the big league lead her to her first solo show at galerie d’art Yves Laroche in Montreal and to participate to multiple festivals in the city. In the past year, Vallières has spent much time outside of Canada, showing notably in The United States, France and Germany. Now Laurence attending No Limit Street Art Borås, Sweden. – Laurence has amazed me all the way since I first came across her work. The fact that she reuses cardboard found on the streets or in waste bins is really cool. Her work has many dimensions to me and the way she combines a deeper meaning with the epic artwork and the funny look of her pieces impresses me a lot. I´m glad to bring another way of interpreting street art in a more sculptural form and I´m really happy to have Laurence coming to No Limit Street Art, says curator Shai Dahan. – I think that Laurence really will add a new dimension to No Limit. She doesn´t see her self as a street artis, but her pieces are made of material solely from the streets. To me she fits our line up for 2015 very well and her work is amazing, says project manager Stina Hallhagen. Curiot currently working and living in one of the largest cities of the world, Mexico City. His work has been seen on walls and exhibitions all around the world. – Curiot has been on my personal wish list since I first met him and saw him paint in Germany a few years ago. So what can I say? I´m really happy to be able to present this artist to our visitors for 2015. The colours and ancient patterns in Curiots murals are really beautiful. It´s really no wonder a lot of admirers over the world call him “El Curiot” – he´s an insanely talented master of spray cans, says curator Shai Dahan. – When I first saw Curiots work I instantly got the feeling that we must have him in our line up. His way of interpreting the relationship between man and nature in a real explosion of colours is really amazing. I´m so excited to see what he will create for us in Borås, says project manager Stina Hallhagen. Polish muralist, painter and animator, Robert Proch is the second artist in our presentation of the line up for No Limit Street Art Borås 2015. Robert, born 1986 in Bydgoszcz Poland, currently lives and works in Poznan, Poland. 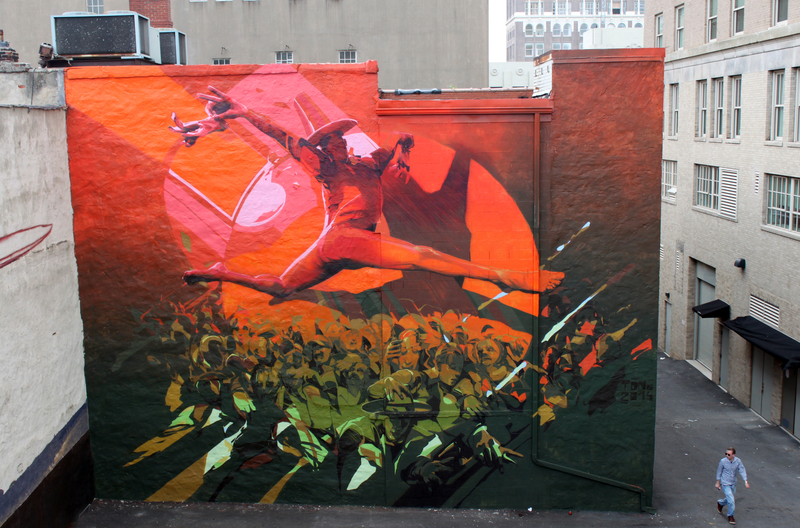 – I´m so happy to have Robert in our line up, he´s got a sense for details you seldom see in large scale murals. The way of building a motif, often in a very abstract way, with quite faded colours is a rare technique mastered by few. I really love his work, it´s really interesting and the more you look at the pieces, the more inspiring details you find, says curator Shai Dahan. – Robert has a manner of describing his work as portraying pretty boring everyday subjects, I disagree. I think he makes very inspiring mural art that really gets to me and makes me think. The colours of his pieces is calm and beautiful and will put a lovely touch to any wall in Borås, says project manager Stina Hallhagen.